You may have heard the heart touching and wonderful transformation for Vassos on Radio two on Thursday with the help of hypnotherapy. I am sure you will agree it was a fascinating and motivating morning for all. Hypnotherapy is truly remarkable and can be life changing. As a hypnotherapist I can put my hand on my heart and say that it changed my life also and has enabled me to help others. You may have also heard coverage and discussion regarding Pippa and James’s up and coming wedding as the show also went on to ask for Cool Bride Stories. Well, what I am about to share with you is a personal and the true life changing glimpse into my story of how hypnotherapy also changed my life. This story has been prompted by my wonderful clients of whom I am grateful and proud of and thank deeply and of course yesterday’s spectacular coverage. I hope yesterday’s result and my outcomes will go towards helping you make the right choices for you. After what seemed like a lifetime of wonder, abundance of love, joy and laughter with my soul mate David; he popped the question! Raptures of joy generated and travelled at lightning speed through each and every cell in my body from my head to my toes. Wonderful feelings I never knew existed before fizzed and popped all over me. It really is true what they say about love and the simple raw beauty of a proposal. Time stood still and it really was the most magical moment I can recall. I felt like I was floating on a cloud of elation. Looking slowly away from my now fiancé to my parents who appeared to be moving in slow motion! I recall my beautiful mum reminding me to answer and assured David that I had accepted his proposal, I agreed enthusiastically. With my head in a spin and the most beautiful feeling l have ever never known I telephone my brother. “Well pleased for you cyst!” Very laid back is our Mark! A magical moment for all. I was now engaged and to marry my soul mate. After a romantic night’s sleep I awoke feeling wonderful and blissfully happy. Peaceful calm and consumed with love. 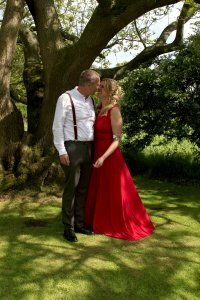 My thoughts wandered towards our big day and what we would do? That brought on different thoughts and feelings, feelings I had not expected or ever thought about or knew existed! “I can’t do this” What a miserable transformation from just the night before! David is the most wonderful man and I knew in my heart and in my head that I really wanted to marry David but I really couldn’t see how I would manage it? I felt terrible and began to imagine all sorts of ridiculous things. I did not want to disappoint him or anyone else for that matter. What could I do and how had I gone from being the happiest in my life to my lowest in such a short space of time? I felt miserable and couldn’t even to talk about the wedding now to anyone. I was devastated and at a loss. I thought long and hard about my options and after much delaying, deliberation and soul searching I sought help through hypnotherapy and from that moment my life changed forever, quite unexpectedly! Hypnotherapy for me was the single most life changing, positive and all-consuming experience I have ever patriated in. I could not believe the change in me. It was amazing! I couldn’t recall feeling this good, this positive with such drive, inner peace and confidence. I was now back on track, the wedding was on! Hypnotherapy inspired and changed me and it was something I now wanted to learn and maybe share with others. To be able to help other people be all they want to be, to relax, be confident and to aspire to the life they want. I soon began my studies and qualified as a clinical hypnotherapist. Hypnotherapy has given me a greater understanding of myself and opened up life and its great potential. I have since had the opportunity to work with some wonderful people and experience possibilities and change that hypnosis can bring. It also gave me another thought about my own wedding that had initially brought me to become a clinical hypnotherapist. I have always had a love of music, a single note of certain songs or pieces of music can bring goose bumps to my skin and flood me with joy, energy and emotions. David and I love music, it’s an important part of who we are and feel. Of course it made perfect sense to sing our song to him on our wedding day! 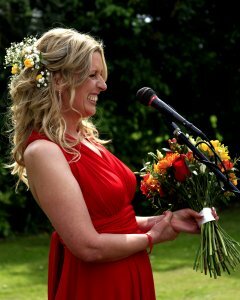 In my youth I recall singing but the idea of singing at my own wedding seemed insane even to me! Also slightly challenging. I recall wondering why I would do such a thing and put myself through this after all this was the girl who initially thought she couldn’t walk down the aisle, would be swallowed up by the day and had been thinking of calling it all off. I had those unwanted feelings again. However now life is different. Hypnotherapy had helped me before and I knew it would again. Time to put my money where my mouth is. This was a knee knocking challenge that would really put me and the power of hypnosis to the test. I kept my idea from David and others whilst I set about my quest of hypnotising myself, extending my horizon, thinking outside of the box and using the tools and skills I had been taught and learned. I immersed myself once again into hypnotherapy. This was going to be ambitious! Blessed with glorious sun our wedding day finally arrived. Time to open up my mouth, heart and soul, to sing my inner most feelings to the man of my dreams, in front of everyone who knows me. This is the rest of my story…..
Just in case you’re wondering it went exactly as I had imagined and envisaged it. The pictures speak for themselves as do the comments at the bottom from the lovely guests and our wonderful family. This isn’t quite the end of my story. 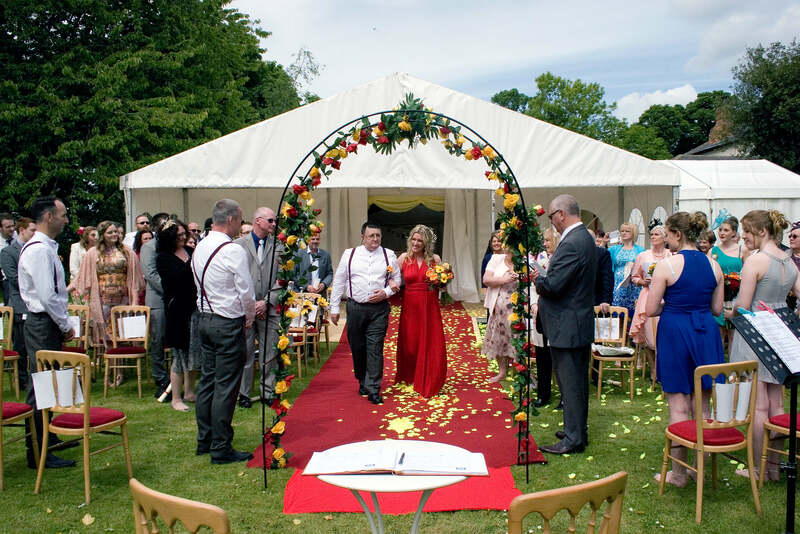 My skills as a clinical hypnotherapist were also called upon by others who would be attending our wedding day with various issues and concerns. What a wonderful gift to be able to help the ones you love. I got married and helped others on our wedding day. It’s the greatest joy and feeling. When I am working with a client I tell them all about hypnosis, the benefits and if I am asked how I became a hypnotherapist I tell them what you now know. How hypnotherapy came into my life quite unexpectedly. I did it for me, to help me. Some of my clients think it’s quite an amazing story and know of others who have been in a very similar situations, whether it be wedding related or on life’s journeys. As a result my clients inspired me and told me to write up my story and urged me to use what I know to continue to help others. Now chuck!! Remember the ceremony been very chilled and laidback. Very natural!! It was wonderful to see my initially nervous bride transformed into a calm and smiling beauty. To say I was shocked when Rachel sung her wedding vows to me is an understatement! Relaxed and calm and all quite natural, no tensions just the Rachel that I love and know. It all added to the super relaxed atmosphere of the day with all our friends. I remember Rachel been nervous about getting married and upset with herself for feeling that way. As her mum I wanted to help her in any way I could. I was impressed with her determination to sort it out and was pleased once she had chosen to use hypnotherapy to help her, she was suddenly relaxed about the whole idea and took to planning the day with excitement and joy. I too was nervous about the day. I am a quiet person who prefers to keep out of the way and I have had some health issues of my own that may have stopped me from enjoying my daughter’s big day. I asked her to help me and I was amazed at how different I felt. I actually looked forward to meeting new people and knew it would be all fine, that everything would be ok. I could not believe it when my daughter sang her vows. What a wonderful moment for her and to see her radiant and confident. Hypnosis has continued to help me and I had a wonderful day with my daughter, family and friends. It was a privilege to be part of Rachel and David’s wedding preparations from the night before to the morning after. The atmosphere throughout the weekend was magical! Everyone was so chilled out and relaxed and having fun. Most of all Rachel and David, who’s love for each other and enjoyment of the ceremony from start to finish affected us all. Being a very close friend of Rachel (and David) I knew how nervous Rachel could be. Listening to Rachel singing her vows to David was a big surprise as well as a very emotional experience for me. I admire Rachel so much for finding the courage to perform that song in front of so many people, helped I am convinced by having hypnotherapy.